MORE awesomeness from Jei Tseng of J.T studios. At the beginning of the year, the all-new 8″ vinyl “Monkey King” figure made its debut at Shanghai Toy Show 2018. 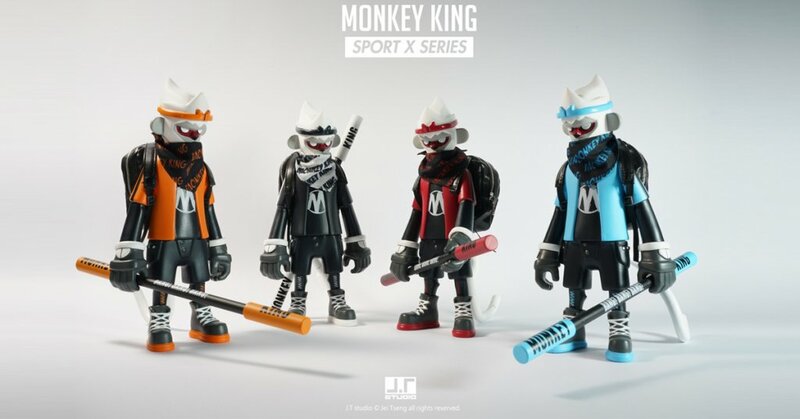 Monkey King joins the new line of vinyl figures from Jei, modern twists with J.T Studio flare with folklore and traditions all tied into the design and now four new editions are set to be released. The Monkey King flexes the Sport X vinyl series which carries enough swag for Hypebeasts adding some street culture to vinyl toys. Jei adds a whole range of accessories with these four from Sport X! TMNT and Power Rangers can now go into hiding. A release date is set to July 16th, stay tuned for the time and how to own one! http://www.jtstudio.com.tw/ for more J.T Studio goodness.